Three weeks ago we reported that GDP had contracted by 2.2% instead of the 1.9% originally reported. Today the ONS has updated its estimate to a -2.4% drop in GDP in the first three months of 2009. The ONS also now says the recession began during the second quarter (Apr-Jun) of 2008 rather than during July to September, so that the recession has now been running for a whole year. This means GDP in March 2009 was -4.9% lower than it was in March 2008. The recently published CBI Industrial Trends survey saw export orders fall sharply in June as the rest of our major trading partners continue to languish in recession too. If it can't be fixed, scrap it! At the end of last week, Lord Mandelson, the authentic, unelected voice of global capital within the New Labour government, stated what he saw as the “simple problem”. He was making a bid for supranational influence in Washington, in a speech entitled “Can we fix globalisation?". Mandelson, who is now effectively deputy prime minister after saving Gordon Brown’s skin, couldn’t have put it clearer: the whole thing is beyond control. Capital does what it has to do, regardless of what policymakers and wonks want. Take pensions, for example. Employers now see their contributions as a major cost to be cut at a time of crisis. Yesterday, the Organisation for Economic Cooperation and Development warned that the destruction of the value of both private and public pensions threatened to turn the two year financial crisis into a “social crisis lasting decades”. An OECD survey found that private pension plans lost 23% of their value last year, while higher unemployment “leaves little room for more generous public pensions”. At the same time, accountancy firm PricewaterhouseCoopers revealed that for the first time many firms are planning to end their final-salary pension schemes for existing staff as well as new entrants. What, you may ask, about the total of $5,000bn (about £3,000bn or £3 trillion) already pumped into banks and pledged by governments to stimulate their own economies? Even if you discount the fact, according to Kroll, the world’s leading risk consultancy, in the rush to spend the money, more than $500 billion – at least a tenth of the total - will be lost to fraud and bribery it’s still a load of cash. Surely all that money is doing its job, freeing the credit markets and restarting investment? Surely the upturn is on the way? The World Bank, another global agency with no power at all to fix the crisis, projects that the world economy will now contract 2.9%, seriously worse than its forecast of a minus 1.75% just three months ago in March. Capital inflows to developing countries will turn sharply down, says the report, falling by a shocking 75%, leading to a 50% contraction in industrial outputs. Germany, Japan and South Korea are heavily dependent on capital intensive exports to economies like Russia, China and Hungary, so will suffer badly from the reciprocal effect of the accelerating downturn. Shares in Russia have crashed 20% this month already, and its banking system has all but ceased lending due to growing fears about a second wave of financial crisis that could hit the banking sector later this year. Meanwhile, back in the UK, 16 weeks have passed since the Bank of England began “quantitative easing” after Alistair Darling authorised the creation of £150 billion of new money, widely trumpeted as the last throw of the financial dice. So far, £96 billion has been spent, of which £93.5 billion was used to buy “gilts”, which means it was not lent to industry for capital investment but lent to the government. But it isn’t working. Overall, lending to private, non-financial companies fell by an average of £1 billion over each of the past six months. It’s OK though, Alistair’s capitalist friends haven’t gone empty-handed. They’ve had £750 million in the form of corporate bonds. It’s amazing how they’ve got away with it for so long, and it’s high time they were stopped. The simple truth is that the capitalist system cannot be “fixed” and instead would benefit from a unique scrappage project much more radical than the one introduced to try and boost car sales. A report by the Office for National Statistics showed yesterday what we all know: the Government's attempts to tackle child poverty are failing. And they're failing for a very simple reason: New Labour has failed to tackle child poverty because it has refused to address inequality and the distribution of wealth. As a spokesperson from the ONS said: "the data suggests that the most significant influence on children's experiences growing up is likely to be income deprivation". There's some very simple things the Government could do: raise the minimum wage, make the tax system more progressive, increase JSA and other benefits, restore trade union rights to increase bargaining power and stop undercutting through agencies. The Morning Star rightly prioritises this story on its front page today. According to the OECD, the "the gap between rich and poor is still greater in the UK than in three quarters of OECD countries". The OECD also reveals that "child poverty rates are still above the levels recorded in the mid-1980s". Leaked plans by the Tories propose to abolish the FSA and hand banking regulation to the Bank of England. Meanwhile, the Government continues to fail to intervene to control the banks that have been nationalised, and to rule out any major steps on regulation. "The banks remain out of control, with the City ratcheting up the prospects of a return to the casino banking, sky-high bonuses, and all the associated risks to the stability of the economy. "We cannot leave the control of our banks in the hands of a small group of speculators and a Government unwilling to act decisively. "It is time now to develop new forms of public ownership and to bring forward proposals to mutualise the banks to develop a co-operative model of accountability." 25/06 update: Prem Sikka has an excellent article on Guardian Comment is Free on the Banking Crash and Lack of Reforms. Yesterday it was announced that the new Chief Exective of the Royal Bank of Scotland, Stephen Hester, is in line for a £9.6 million pay package this year. It's worth bearing in mind that RBS would have gone to the wall without the state bailout last year. We warned at the time that owning the banks without controlling the banks would lead to a return to the same greedy practices which caused the UK banking collapse. Since being saved with taxpayers' money, RBS has announced over 10,000 job cuts. Our 70% stake in RBS has not saved jobs, but is now being used to pay one individual nearly 3000 times what ex-RBS staff will be receiving on the dole. LEAP Chair, John McDonnell MP has tabled EDM 1721 'Banking Sector' calling on the Government to "intervene to control the banks in which it has a public stake and legislate to ensure the interests of bank workers and customers are prioritised by the banks rather than the bonuses, pay and dividends of executives and shareholders who caused the UK banking crisis." 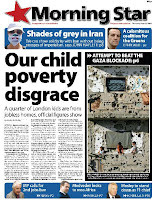 The issue is well covered in today's Morning Star. While Parliament has blocked previous attempts - led by John McDonnell MP - to unpick Thatcher's anti-trade union laws, workers at Lindsey and those taking solidarity action are tearing up the laws on the ground. The right to work, and therefore the right to income, is a key economic right. Total may think it can walk all over its workforce, but the Lindsey workers and their supporters are proving where the real power lies if people act together in unity. 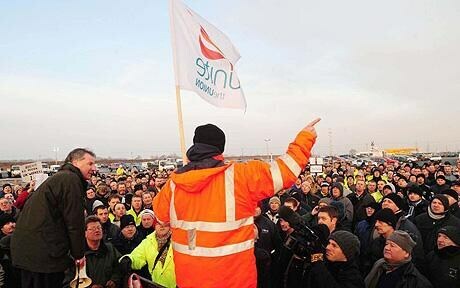 "We fully support the Lindsey workers who have taken strike action today and urge others to come out in support of those workers. "We are calling on the employers to immediately come to the negotiating table to seek a just resolution of this dispute. "The courage of the Lindsey workers has demonstrated that trade unionists are no longer willing to accept the anti-trade union laws. The Government should act now to scrap these laws which deny the basic right to strike." There's also been excellent coverage in the Morning Star, by Professor Gregor Gall on Commment is Free, and on the A World to Win website. The Chancellor Alistair Darling has ruled out tighter banking regulation - attributing the sector's collapse to a few bad apples in individual boardrooms. The Chancellor was giving his Mansion House speech to the City on Wednesday night. "People are losing their jobs in vast numbers as a result of city speculators bringing the economy to its knees and yet Darling refuses to take decisive action to control the banking sector. He is simply setting the scene for a return of the casino economy and the bonus binge culture." "Darling is right: we do need better people in the boardrooms of banks. More women, more trade unionists, more people who can robustly question the whole model of banking and who have the mindset to do so. Banks failed in part because of a collective myopia. "But they also failed because investment banking was allowed to dominate retail banking. Because our basic capacity to make payment within our economy was almost destroyed by gamblers willing to stake other people's money on bets which they ensured gave them an upside and others the downside. This basic utility - the control of our money - has to be reclaimed from such people. That requires massive banking reform. "And we have to ensure that never again can banks cut and slice debt in tax havens and sell it as good when it was anything but, with resulting cost to us all. That means bank accounts, their access to offshore, the regulatory capital dedicated to offshore banking, and the regulation of these places has to be massively reformed. Ignore any of these and the crisis will come back again, and again, and again." "The corporate takeover of Britain is complete. Corporate elites have unleashed economic havoc on ordinary people but have organised deeper reforms off the political agenda. "The practices which incubated the crisis remain untouched. There are no changes to banking practices, composition of company boards, rights for depositors, mega salaries for failure, conflict of interests and light touch regulation remains the dominant philosophy. History repeats itself, first as tragedy, second as farce"
LEAP discussed the possibilities for tighter banking regulation in our May 2008 'Credit Crunch' Red Papers and again in the November 2008 Red Papers: 'The Economic Crisis'. UK Unemployment has risen to 2.26 million today, with the number of people in work down 271,000 in the last month - the highest quarterly decrease since records began. "These shocking figures demonstrate that all the talk of 'green shoots of economic recovery' is absolutely meaningless for the nearly hundred thousand people joining the dole queue every month. "The onus is now squarely on the shoulders of the Government to act decisively to halt the rising unemploymenbt and offer, particularly the young, real alternatives of meaningful employment and training. Guaranteed training and education places based on living wage grant for the unemployed". It's also worth reminding people that unemployment benefit is just £64 per week, dropping to £50 if you're under 25. In the last few days a number of analysts have suggested we may be 'on the up', Government Ministers have been wheeling out the cliches 'turning the corner', 'green shoots emerging'. Today, LEAP was asked to comment on reports by the National Instutute of Economic and Social Research (NIESR) which states that the recession is over. They estimate that GDP has increased by 0.1% and 0.2% in the last two months. This is pretty minimal and within any sensible margin of error. Others have pointed to UK manufacturing production having increased by 0.2% in each of the last two months. But looking at the data in absolute terms gives a different perspective. Output in February, the current trough of the credit crunch, was 13.9% below the 2008 peak. After two months of 'recovery', production is 13.5% below the peak. Data from the rest of the world, especially the US, Germany and Japan continues to be negative - and the global recession will not recede until the major economies see an upturn. To look at the UK in isolation, without considering our major trading partners, is naive. Even if official figures (out next month) confirm a stabilisation, or even a moderate upturn, there is no inevitability that the subsequent quarter (summer to autumn) won't see a retrenchment. "The effects of a recession on working people always lag behind the economic data of GDP growth. When the UK economy was entering the 'Lawson boom' of the mid-eighties, unemployment was reaching its peak. "This highlights how we measure recession is skewed towards the dominant interests of capital. Why don't we start defining 'recession' as when poverty levels are over 10% or unemployment (ILO measure) over 1 million." In short, just because the corporate profitability of UK plc might be being restored, it does not mean we will see an end to rising unemployment, rising repossessions and declining pay awards anytime soon. Our comments appear in greater depth in the Morning Star. Update: Ann Pettifor argues similarly on Comment is Free today that the recession is far from over. Update 2: The CBI has today (15/06) also warned "Some commentators have been carried away by recent tentative indicators as evidence of 'green shoots'"
Update 3: Richard Murphy says on his blog today (16/06) "I don’t spy green shoots. I just see markets making merry on tax payers money which they are using for speculation, not lending. Which is why firmer control of banks is necessary". Quite. With all the media attention focused on the infighting within New Labour, you'd be forgiven for missing the news that UK GDP fell further than initially thought in the first quarter of 2009. Although announced as the worst fall in GDP since 1979 at 1.9%, in fact is now estimated by the ONS to have been 2.2%, as the construction industry contracted more severely - 9%. Maybe, while removing the knives from his back (and passing them to Nick Brown to stab back), Gordon Brown has noticed this, and that's why he's appointed Alan Sugar - a man who's Amstrad company employed an imperial 85 people before collapsing into BSkyB, and who turned Tottenham from mid-table also rans into mid-table also rans in his time as chairman. This feature on his media ego trip (aka The Apprentice) I think raises questions about his merits. Alan also asked a female interviewee how she planned to look after her children if he gave her a job. Gordon obviously keen to combat the sexism slurs . . .